Don Bluth, having finished "The Secret of NIMH" to rave reviews and the bankruptcy of his business, hooked up with Steven Spielberg's Amblin Entertainment for "An American Tail" (1986). Unlike Bluth's first feature film, this one turned out to be both a critical and a financial success. It is a charming tale with first-class production values, and like Bluth's other films has developed a cult following that only seems to grow with time. It owes a large debt of gratitude, of course, to Disney movie "The Rescuers," which introduced the concept of cute mice as lead characters. It is 1885 in Russia, and a Russian-Jewish family of mice - the Mousekewitzes - are being attacked by vicious cats belonging to Cossacks. 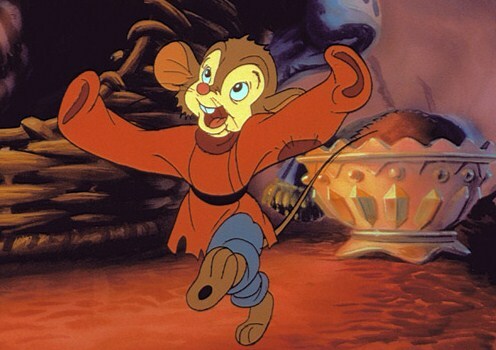 With their village destroyed, the mice board a ship and begin their journey, but the boy, Fievel (Phillip Glasser), is washed overboard en route during a storm. 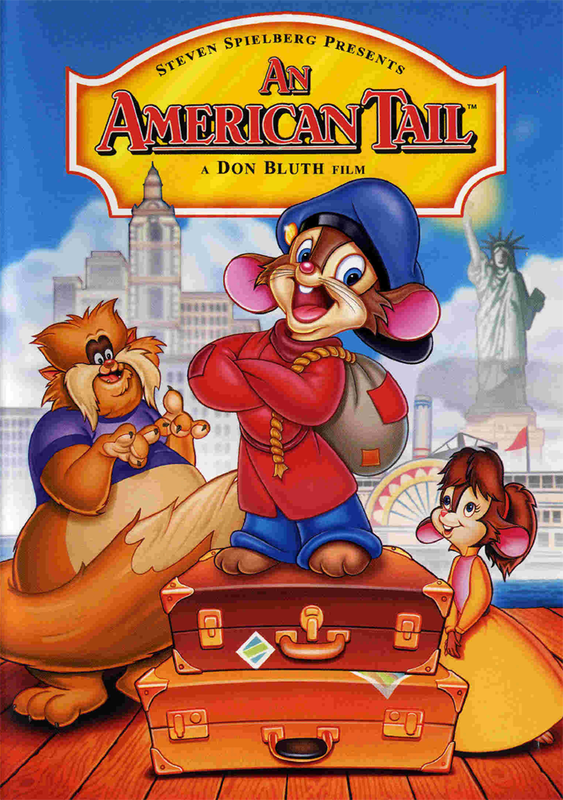 The family eventually arrives in America, believing that Fievel has drowned. Fievel, however, is fine after having floated to America on a bottle. He befriends a pigeon, Henri (Christopher Plummer), who encourages him to find his family. 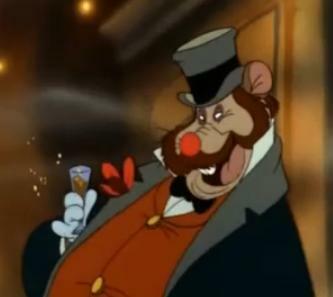 Along the way, conman Warren T. Rat (John Finnegan) befriends him, but then sells Fievel to a sweatshop. 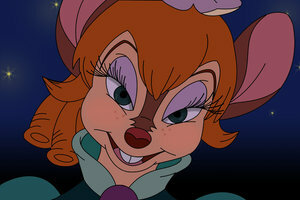 Fievel manages to get out and hooks up with Italian mouse Tony (Pat Musick) and Irish mouse Bridget (Cathianne Blore). Their illusions about America being cat-free is shattered when a gang of cats attacks them in a marketplace. 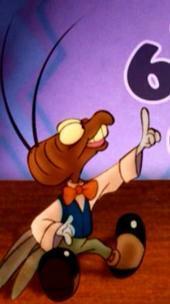 An anti-cat organization led by Gussie Mausheimer springs up among the mice, and Fievel figures out a plan. The mice begin building a trap for the cats in an abandoned building on the Hudson. 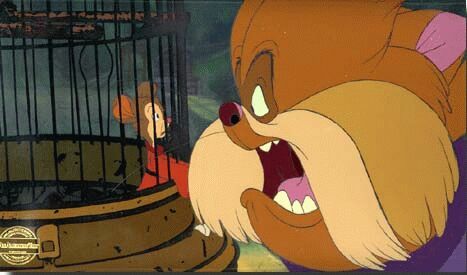 Fievel finds out that Warren T. Rat is actually a cat in disguise, but before he can tell anyone, he is captured by the cats and locked up. Things don't look good for him until a nice cat named Tiger (Dom DeLuise) befriends him and sets him free. The cats chase Fievel back to the pier, right into the trap the mice have set. When the cats arrive, the mice release a giant mechanical mouse. It chases the cats off the pier and into the Hudson. They climb onto a tramp steamer headed to China and are never seen again. 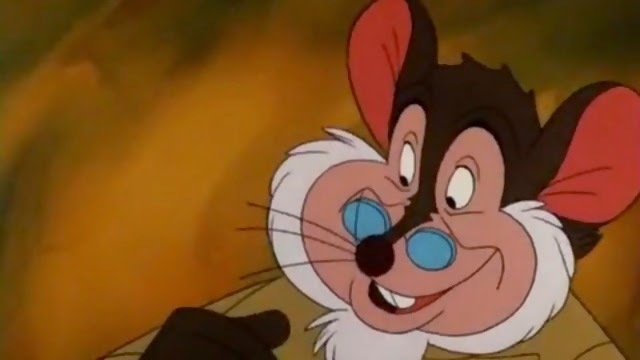 Fievel's mother (Erica Yohn) finds his hat after the battle, and Papa Mousekewitz (Nehemiah Persoff) realizes his son is still alive and start thinking of a way to find him. 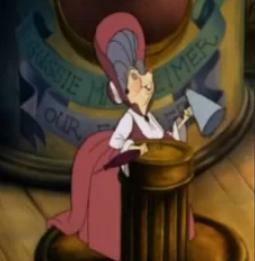 "An American Tail" is done in Bluth's usual animation style, with rotoscoping of human characters and cartoonish animal figures. This makes the humans look very realistic, while the animals have more of a dream-like quality. You don't see many people anyway, they usually are left in the shadows or only shown partially. The colors usually are dark and moody, befitting the subject, but that makes the animation seem of lower quality than it might if everything were bright and cheery. There are some bright colors during the happy occasions, but those are few and far between. The animation can get a bit distracting at times because Bluth likes to move it around a lot, but you get used to it. Also, the animation tends to be a bit inconsistent, with characters noticeably changing shapes and sizes. The tale is an obvious political metpahor for the immigrant experience and their "the streets are paved with gold" misconceptions. It is easy to read a lot into it, perhaps more than was intended. The mice are portrayed as being naive and of various religions and backgrounds, while the cats seem to have a vicious predatory uniformity between Russia and the United States. And therein lies the polemical underpinnings of a film that pretends to be merely whimsical, but isn't actually whimsical at all. It has a lot to say and a clear political agenda. The political viewpoint is a bit over-done, but that probably was the intent, to hammer the point home. While it's obvious who the cats represent in Czarist Russia (oppressive government officials who enforce the laws for 'the man,' with probably some tacit religious overtones as well), it's a bit less clear who they are supposed to represent in the States. This ambiguity or vagueness is one of the key flaws in the film and could unintentionally make some people uncomfortable. The symbolism is open to interpretation, but one can surmise that the cats in the U.S. are meant to represent all those U.S. natives who resent nice, presentable, friendly immigrants like Fievel or want to abuse them and give them a hard time. You know, the 'I have a bridge to sell you' types. And, again, there may be a completely hidden religious theme going on, the 'elephant in the room' which it would be impolitic to actually bring out into the open. There certainly is an underlying xenophobic attitude here, but the kicker is that it lies on both sides - the mere presentation/perception by the filmmakers of the US natives as vicious yet cunning and underhanded oppressors says a lot more about the insularity of immigrant communities (natural, certainly, but very real) than it does about the natives themselves. 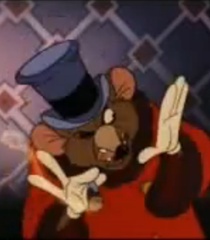 Remember that we are seeing the cats as Fievel and his cronies see them, not as they really are. And everything is relative - when we talk about 'natives' who are presented as oppressors, it may just have been some guys who got off a boat themselves only a short time before. Or they may be, perhaps, whoever was hired to enforce laws that the poor immigrants don't even know they are breaking or who try to shove their own religion onto the new people. Or merely whoever owns nice things and isn't sharing them with needy immigrants. The point is, the cats are 'them,' as in, 'not us,' and therein lies the twisted heart of 'An American Tale' - insularity and disengagement by the immigrants from the newness of the new land. If everywhere you go on two continents you run into the same sorts of oppressors - maybe they're not the ones with the problem. When you perpetually feel put-upon and act out as a result, maybe you're the oppressor. 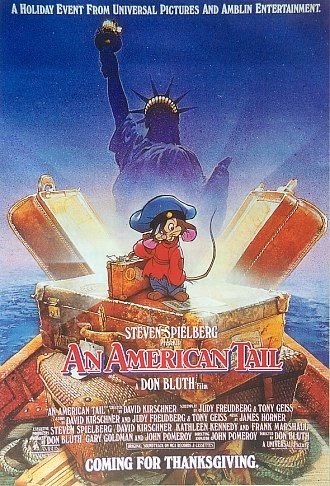 There is a lot of darkness in "An American Tail," just like there was a lot of darkness during the immigrant experience. Child labor is depicted, as well horrible violence by the cats. There's a manipulative con artist cat, scenes of cats destroying homes, and a lot of edgy cat scenes in general. Little children may be disturbed by some of this and may not look at the family cat in quite the same light for a while. 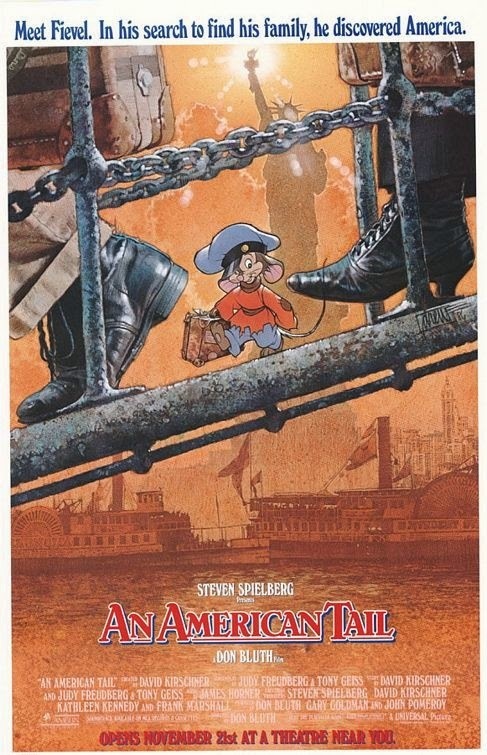 However dark it may be, though, "An American Tail" was very personal to Steven Spielberg: his mother, Leah Adler, is reported to have said that one day, out of the blue, Steven called. He asked her, "What was Dada’s (her father) Jewish name?" After she told him it was Fievel, she heard no more about it until the film came out. The music by James Horner is all right, not sensational. Barry Mann does the songs, and "Somewhere Out There" may stick with you for a while, as well as "There Are No Cats." "Somewhere" was nominated for an Oscar and a Grammy. Probably the weakest part of the film is the plot. The story has little going for it other than "young immigrant is lost in New York." 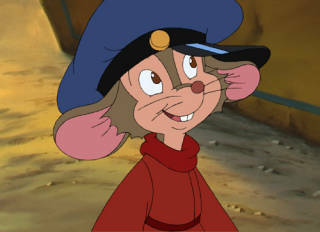 Yes, Fievel is cute and adorable and all that, and that carries the film as far as it can. 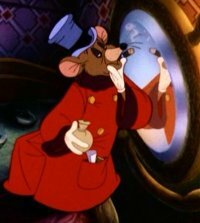 Character development, though, leaves something to be desired (the sudden friendship between Tiger and Fievel is a bit much), and there seem to be an awful lot of stereotypes in the film (drunk Irishmen, noble, brave, pure and cultured immigrants, relentless oppressors with no morals, that sort of thing). That does set up a nice us-versus-them confrontation, though. I sure hope those cats like Hong Kong! Overall, Bluth's previous "The Secret of NIMH" is the better film, but this one appeals directly to a broader demographic and had the marketing power of Steven Spielberg behind it. There's a lot more to successful filmmaking than quality, and the different performances of the two films at the box office really shows that. 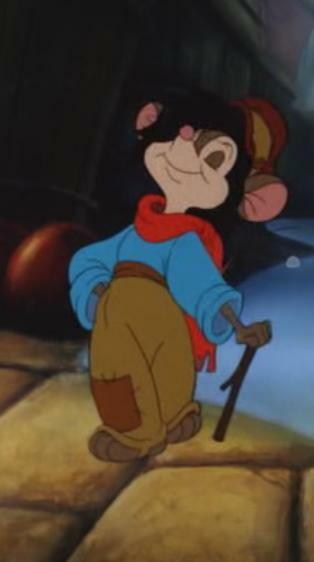 "An American Tail" is a good animation film that you will enjoy if you identify with the poor, oppressed mice, and one of the better animation films of the '80s. Good day! I just wanted to highlight that you really succeeded in organizing a splendid blog. Also I wanted to ask you one thing that I am curious of. Do you take into considerations writing professionally or blogging is basically just a hobby of yours?